Jack Kerouac with his “On the Road” rolling homily, had nothing on the Bible. The story in Luke 24 about two travelers going home after the crucifixion of their beloved friend and healer, Jesus, is a poignant story. The travelers, likely a couple, are full of sadness and also dashed hopes for the long-awaited Messiah who would redeem their Israel. They thought Jesus was the one and now he was executed. On the road, a stranger came and joined the bereft travelers. He listened to them talk and asked why they were so sad. They were amazed that he didn’t know all that had happened in Jerusalem, and how scared they were of the powers of oppression. First, he listened well to their grief. Take note of that compassionate habit. How he must have wanted to interrupt them with his spiritual intuition about resurrection! But he listened first. Only after listening did he break in with an extended, and obviously compelling, recitation of the biblical history of God’s promises, the prophets’ visions of a divinely-sponsored grand socioeconomic program of justice, and Jesus’s own vision of God as unconditional love—now and forever for all creation. Oh, they were crushed as they talked about their sorrow. Oh, they felt heard and taken seriously. And oh, how their hearts burned within them—burned with hope and renewed passion—as this stranger reiterated everything they knew, and had forgotten. The group of three walked toward Emmaus, a journey of seven miles, and as they went they talked and listened, and, in that process alone, their spirits were renewed, their hopes resurrected. When I read this famous parabolic story, I think of this whole first part as The Word—the first part of every Christian Eucharist: biblical readings, collects and prayers, a sermon, hymns and chants—and community announcements and news. The Word takes up more than half of the entire length of the average Sunday Eucharist. Like the words of the stranger on the road to Emmaus, most of the mileage is taken up by listening to the travelers' concerns, and then teaching them once again to hope and trust God’s loving care. The Word is just as much of a sacrament, just as Holy, as the beloved Eucharist, the meal many of us think it the most important. Well, of course it is: we get fed at a table to which we ALL are welcome and ALL are beloved. The meal is a kind of tangible proof of all the proclamations and predictions and visions and stories that compose The Word. Yet, the story tells us, only in the meal did the traveling Jesus-followers, aka Mr. and Mrs. Cleopas, FINALLY recognize that this stranger was in fact the one they lamented as dead. They intuited the wisdom of their Jesus in the words of the stranger. They recognized Jesus as the Christ for sure, and finally, as the bread was broken and shared over a meal. Writers about Jesus's habits often juxtapose miracle and meal, like resurrection and eucharist. Still, why did it take so long and require so much wordiness and WORD? Well, I suppose it is because it takes a while for the message to travel from the mind, fourteen inches down to the heart, and another ingestive period of time for the body, at last, to consume the whole truth: God loves all Creation without condition. ALL are beloved. 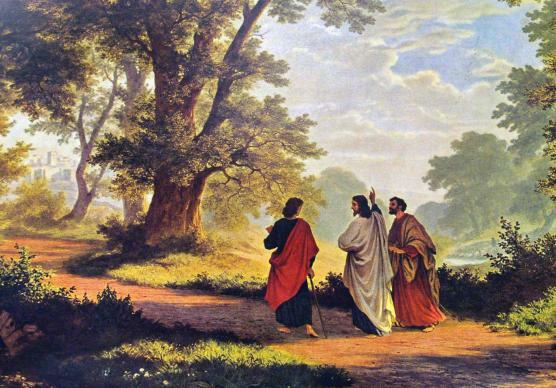 Emmaus is a metaphor that tells us, over and over, that this Love is true, that is available. We know it when we experience it in conversing and listening, giving and receiving. This is how we know the Risen Christ. After you give the flesh and blood beggars money, then offer them a greeting, good luck, and a word of hope for healing, or a God bless you. (Notice: they almost always bless and thank you!) Don’t preach. Don’t ask for anything. Don’t assume or condemn. You don’t know why they are there, but you know they are there for a reason. Just honor their presence as their word, and your money will be their bread—yes, even if it buys booze. Then be on your way with prayers and the “high spirits” of hope Emmaus conveys.